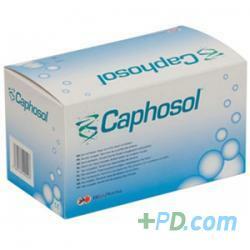 Caphosol is a supersaturated calcium phosphate rinse with a high concentration of electrolytes simulating the missing natural saliva. It lubricates the tissues, makes them slide easily on contact, minimizing friction, ulceration and corresponding pain and discomfort associated with these conditions. Caphosol Oral Rinse Weekly Oral Rinse Weekly Pack product. Delivery cost of "Caphosol Oral Rinse Weekly Pack"